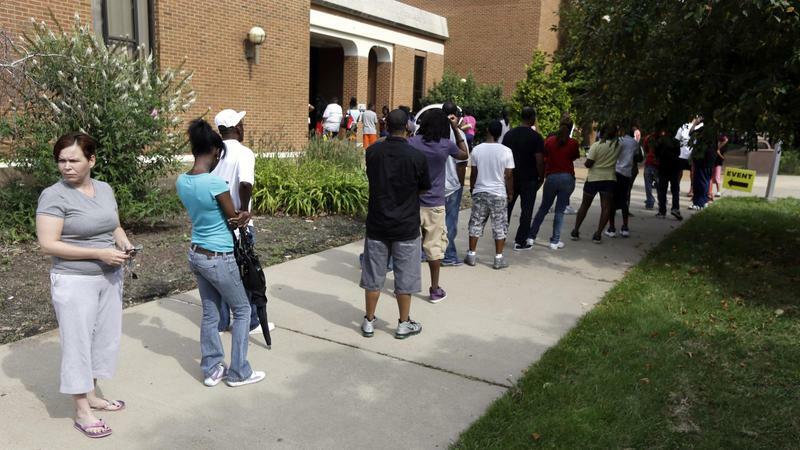 People line up to take part in an amnesty program to clear up outstanding misdemeanor arrest warrants in August 2013 in Ferguson. But that doesn’t mean that the Justice Department is powerless. Nor is the Justice Department the only player that could bring about change. ArchCity Defenders and Saint Louis University law professors have filed lawsuits against Ferguson and Jennings for operating “debtors’ prisons.” The Municipal Court Improvement Committee is pushing incremental changes in municipal court procedures. And bills sponsored by state Sen. Eric Schmitt, R-Kirkwood, could force the worst police departments out of business. 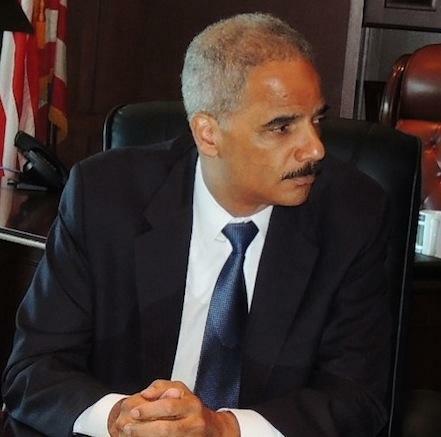 Attorney General Eric Holder visited Ferguson last August. Attorney General Eric Holder said in announcing action against Ferguson that the Justice Department would press surrounding municipalities to fix their unconstitutional police and court practices, too. Lawyers and police say a dozen north county municipalities are worse than Ferguson. But legal experts say the Justice Department can’t just insist on compliance in all of the surrounding municipalities. David Harris, a law professor at the University of Pittsburgh, says, “There is no way to drag another municipality into Ferguson’s case. The investigation is of Ferguson. But what this will do is to communicate very sharply to these other municipalities what the limits are with the Department of Justice and if they want to avoid their own investigations they ought to fix these things. Samuel Walker, a professor and police accountability expert at the University of Nebraska, agrees. Both he and Harris point out that the Special Litigation Section of the Civil Rights Division is a small operation that lacks the resources to expand its investigation of patterns of unconstitutional policing to neighboring municipalities. “DOJ, as a practical matter, could not investigate all the jurisdictions in the metro St. Louis area,” said Walker. “There are just too many, requiring too many DOJ people. Perhaps the best approach would be for Holder or the new AG to use the proverbial ‘bully pulpit’ and give a well-publicized speech about the problem and possible remedies – and do it in St. Louis. This would help to energize local civic leaders. Stephen M. Ryals, a St. Louis County civil rights lawyer, says he has seen first-hand the experiences of some poor defendants in Ferguson’s municipal court. In fact, he had his own run-in with Municipal Judge Ronald Brockmeyer – a run-in detailed in the report without naming Ryals. Ryals already has heard court personnel in other municipalities talking about how they don’t want to make the headlines like Ferguson. “If I was in charge of one of these other municipalities that has not been targeted by the Justice Department, I think I’d be inclined to initiate a pretty careful review of my practices. I’d look at charging practices and the fine structure. ArchCity is the public-interest legal organization that led the way in bringing the abuses of municipal courts to public attention around the time that Michael Brown was killed in Ferguson last August. ArchCity Defenders executive director Thomas Harvey spoke during the last meeting of the Ferguson Commission. Thomas Harvey, its director, praised the Justice Department for validating the group’s criticism of municipal courts. But he also said that solving Ferguson alone will not make much of a dent in the overall problem. “Without comprehensive and transformational change or the abolition of the municipal court system, individual reform in single municipalities will never truly change the lives of the most vulnerable among us,” Harvey said. Harvey said his group intends to continue its civil rights lawsuits. Last month, ArchCity and Saint Louis University Law School lawyers sued Ferguson and Jennings for running Dickensian “debtors’ prisons” where poor people are locked up if they can’t pay court fines. The class-action lawsuits on behalf of 15 citizens claim that the towns violated the constitutional rights of the citizens because the Supreme Court says people can’t be imprisoned for failing to pay fines. 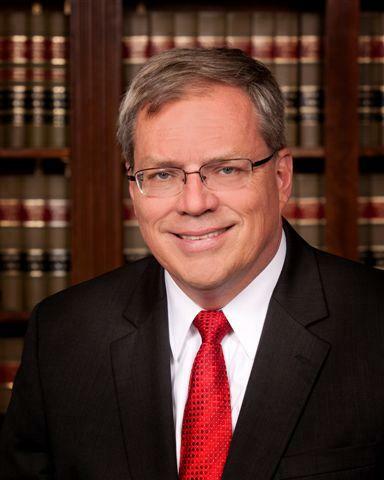 Vatterott thinks the lawsuits filed by Harvey and Roediger are misleading. “It tells this unbelievable story and it reads like that Charles Dickens novel about debtors’ prisons, but it never mentions the main fact that they are in jail because of they didn’t show up in court. Turning to the portion of the report that suggested ticket fixing among municipal court clerks, Vatterott said, “I had heard all of those stories before. They say clerks fix stuff in between themselves, and I’ve always heard that. But a traffic ticket is not an ax murder, and in the old days they were fixed all over the world. An “amnesty” program in December allowed about 3,000 people to get out from under warrants. But that still is a small percentage of the estimated 200,000 warrants outstanding, he said. 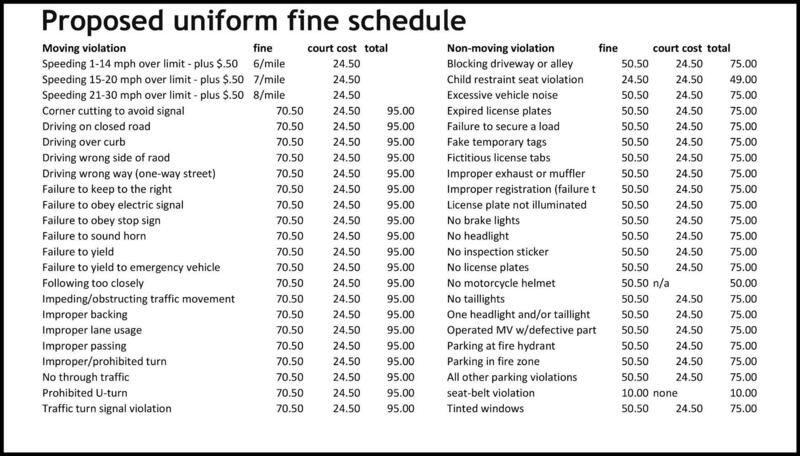 A new uniform fine schedule (see below) went out to municipal courts this week for their consideration. It would substantially lower fines in some of the smaller towns, Vatterott said. 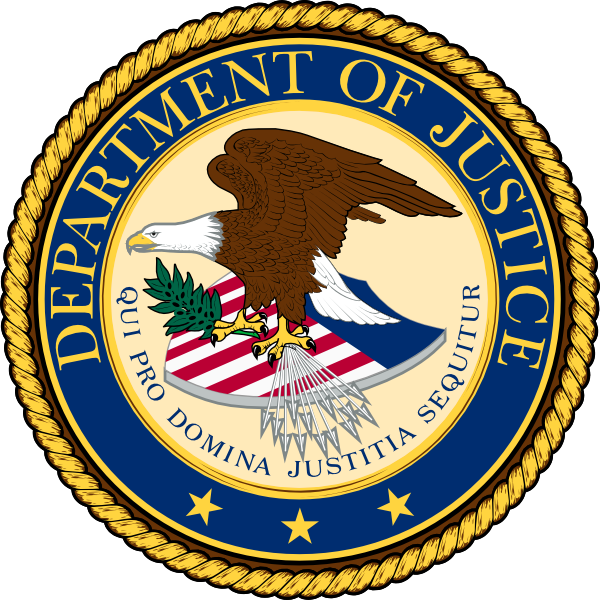 High fines in Ferguson were a target of the Justice Department report. Community service may be proposed as an alternative for those who can’t pay their fines. Bail reform to enable municipality A, which is holding a person under a warrant from municipality B, to take the bond for B and release the citizen. A new notice on tickets would inform citizens that they won’t be arrested if they come to court and don’t have enough money to pay the fine. The Ferguson report said that many poor people don’t go to court because they fear they will be arrested. Vatterott acknowledged, however, that some municipal courts check the docket against outstanding warrants and arrest those with warrants when they arrive. So the new notice may not entirely solve the problem. Volunteer lawyers providing free advice could protect the rights of poor citizens. But Vatterott said his committee’s proposal for volunteer public defenders got a cold reception from municipalities, which thought the free lawyers would bring court to a standstill. Harvey also criticizes the volunteer defenders saying permanent paid public defenders are needed. Vatterott has high hopes for a big grant the county is seeking from the MacArthur Foundation to set up a central municipal court office. This office could more effectively implement the bail and volunteer public defender proposals, he said. The University of Missouri-St. Louis has been “chomping at the bit” to help in Ferguson, Vatterott says. It is helping to put together the grant proposal. Roger Goldman, an emeritus law professor at Saint Louis University, says the most effective way to reform north county police departments may be an indirect one – Schmitt’s bill, Senate Bill 5, putting a lid on the percentage of revenue a municipality can raise from fines. State Sen. Eric Schmitt's bill limiting the amount of a city's revenue from traffic fines has passed the Senate and now must be considered in the House. Schmitt’s bill could bankrupt some small municipalities that now collect up to 30 percent of the income from court fines; the bill would set a 10 percent lid by 2017. Goldman notes that St. Louis County police took over policing in Jennings in 2011 and that since then serious crimes like homicides, stabbings and rapes are down by a third, based on state statistics. Vatterott isn’t taking a position on Schmitt’s bill. But he is concerned about a couple of related proposals he says Schmitt is pushing. One would limit a person to being a municipal judge in just one town, and the other would bar criminal defense lawyers as judges. Attorney General Eric Holder Wednesday attempted to reconcile the contrasting outcomes of two separate Justice Department investigations stemming from the shooting death of Michael Brown -- one that cleared then-Ferguson police officer Darren Wilson in Brown's death, the other that called Ferguson's police and court system racially biased.